I’ve been dying to use the ‘dandelion fluff’ stamp from the Balloon Celebrations stamp set, so when I was planning for my technique club, I just knew it would be perfect for a spinner card! When the card is tilted, the circle with the fluff on it goes spinning from one side to the other. It’s just like when you blow on the dandelion, and the fluff goes flying away! Combining it with the Sale-A-Bration Wildflower Fields DSP dandelion pattern was genius, don’t you think?! 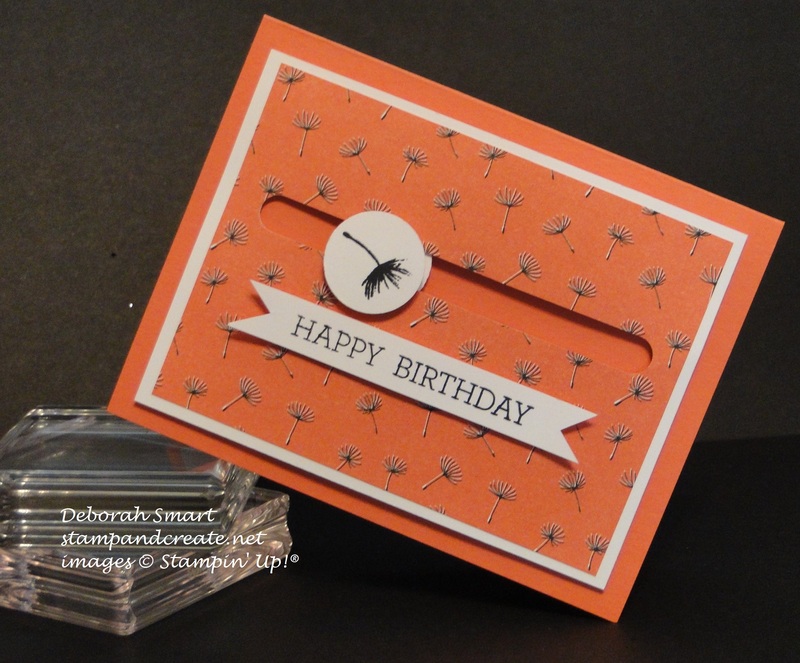 I wanted to make the spinner fluff stand out, so I stamped it on a 1″ Circle of Whisper White cardstock in Archival Black ink; same with the greeting which is made by combining the ‘happy’ and ‘birthday’ from the Crazy About You stamp set. I love this set; it has so many sayings that can be made simply by combining the single word stamps onto 1 clear block! We do have lots of fun at our Technique club; we meet the last Friday of each month, and I show everyone at least 2-3 new techniques/fancy folds, complete with step by step directions. We create samples of the techniques to keep in our binders, and complete at least 1 full card/project using at least 1 of the techniques. Previous Previous post: A Beautiful Day! Deb, this is such a wonderful card. I like spinner cards, but they are very difficult to pull together. You did a great job on this card! Jackie, you should give the spinner card another try; everyone in class was so surprise how easily it went together! I’m just a big kid – love playing with interactive cards 🙂 Thanks so much for your kind comment!